As library travel budgets are increasingly slashed around the country, it’s a tough time for conference-going. In this group post, we compare notes about the conferences we’ve attended, which have been our favorites, and why. We hope this will generate creative ideas on good conferences (online or in-person) to look forward to, and maybe offer the additional benefit of making us more educated conference consumers. Please join us by sharing your experiences in the comments below. I’m the one who suggested the topic and I probably have the least to contribute on account of it. I’m really very interested in reading all the responses and hope many of you take the time to leave your favorite conferences (and why) in the comments. I’ve always had a good time at ALA and typically walked away with new friends and new ideas, but I’m looking to try a smaller (and hopefully more cost-effective) conference next year. I had a really fantastic time a our first annual Library Instruction Round Table (LIRT) regional summit. It was free and included lunch. And I’m not even a member of LIRT! (I did offer to head a table talk topic, so I was kinda/sorta a speaker.) One nice thing about the LIRT conference was that it was all local librarians. I either knew, or knew someone who knew nearly everyone there. I have also been going to the Texas Library Association annual conference regularly for the past four years (as long as I’ve been a professional librarian). I’ve spoken at the last three TLA conferences and I know that has definitely made it a more interesting, engaging, and rewarding experience for me. I’ve had the opportunity to attend a decent array of library conferences over the past six years, some as an MLS student, but most as a new-ish librarian. I’ll highlight a few conferences that have had strong influence on my development as a librarian and that I would recommend to other librarians. My first library conference was either the Federal Depository Library Council Meeting or the LITA Forum—I can’t remember which came first. I was still getting my MLS out of the way when both of these came to town (St. Louis, MO) and I wanted to take the opportunity to find out what they were like compared to the botany and evolution conferences that I had attended as a biology grad student (aka, life before librarianship). For the Federal Depository meeting, I was joined by a few fellow MLS students and faculty who tucked us under their wings and gave us the inside scoop on what the big issues were, how to read between the lines and introduced us to their librarian colleagues. Their insights made it much more interesting than it might have been to our untrained eyes. As such, the Federal Depository meeting has been the most contentious conference that I’ve been to in the 5-6 years that I’ve been going to library conferences. Those government docs librarians really know how to get into a debate! So, if you’re looking for some intense discussion, I’d suggest adding a Federal Depository Library Council Meeting to your conference plan in the near future. The LITA Forum was completely different. I didn’t know anyone at this conference—none of my fellow MLS students attended and if any other faculty in my program attended, I didn’t see them there. While I didn’t get to benefit from the insights of a steadfast LITA member, I did participate in an unusual way. In exchange for helping out with the sessions, I got a reduced registration rate. I was one of those people who collected session evaluations and reported A/V problems to the facility staff. While I couldn’t always devote my full attention and let everything just sink in, the sessions that I got to attend were all new to me and as such, were pretty foundational to my entry into librarianship. I remember attending one of the early sessions by Nancy Fried Foster (the anthropologist who collaborates with Susan Gibbons at the University of Rochester on studying how students work) where I took the opportunity to meet Cliff Lynch, one of my libraryland heroes. This LITA Forum was also where I attended my first dine-around (I don’t think we had dine-arounds at the botany and evolution conferences) and as luck would have it, ended up splitting pitchers of beer with my future colleagues at the NCSU Libraries—Andrew Pace, Steve Meyer and Steve McCann (none of whom are still at the NCSU Libraries). It was a fortuitous conference. I would most certainly attend another LITA conference in the future; it’s just that my particular focus has shifted from an open playing field (in 2004) to collection management and collection assessment and it’s not always easy to justify attending conferences outside my specific area. The LITA Forum I attended was a smaller affair—the venue was easy to navigate (all in one spot) and the number of attendees wasn’t overwhelming. It was easy to rub elbows/beer steins with smart, inventive librarians and library visionaries. My conference/professional organization of choice has been the Special Libraries Association (SLA). As a student, I joined the local chapter of SLA (St. Louis Metro Area Chapter) and met some super helpful mentors who I’ve continued to keep in touch with through the years. Whereas other organizations wouldn’t give me the time of day as an MLS student (namely, ALA), SLA saw me as a positive asset to their organization and began grooming me immediately. So, naturally, I’ve been a loyal SLA Annual conference attendee since 2005 (Toronto) and am now the lead in planning for the Science-Technology Division (of the SLA) sessions at the upcoming SLA Annual Conference in New Orleans in June. Don’t be mistaken in thinking that SLA Annual conferences only focus on corporate librarianship. SLA is one of the most diverse organizations and includes academic, public, and government, as well as corporate and solo librarians. When they get together to carry off a conference, good things can happen. Yes, I’ve been to some mediocre conference sessions at SLA, but I’ve also been to some astounding sessions. I always bring back a notebook of new ideas and new ways of seeing things. SLA Annual conferences have been my way of filling in the gaps of what my MLS program omitted and of keeping my professional training up to snuff. SLA offers loads of pre-conference training programs (some half-day, some whole-day) and while they do cost an arm and a leg ($300-400 average each), SLA has a healthy set of travel awards and stipends to help offset the cost burden. MLS students and new librarians should, in particular, pay attention to these funding opportunities as there are many to apply for. I can’t say the same great things for the SLA Leadership Summits that I’ve attended. The SLA Leadership Summit events are open to all SLA members, but are mostly meant for SLA leaders (i.e., division/chapter chairs and presidents, secretaries, treasurers, chair-elects, etc.). Some of the programs aren’t very compelling (they usually bring in a motivational speaker who has no idea what librarians do to talk to us about things like loyalty and persuasion—a little too much tipping of the Kool-Aid for my tastes) and make some days seem to last into infinity. The upside is that the networking and individual division/chapter planning opportunities are excellent. Again, another chance to rub elbows/beer steins with creative people, renew friendships, and meet new colleagues. So, my advice is to include some SLA Annual conferences in your future. They’re not nearly as big and overwhelming as ALA Annual and are much easier to navigate and run into people who you want to build professional relationships with (and there are no book cart drill team competitions). The other conference I want to highlight is the Charleston Conference (next one is November 3-6, 2010). This is an excellent, intimate conference for those who have any deep or fleeting interest in collections, acquisitions, and scholarly communication. Unlike any other conference I’ve been to, the Charleston Conference has a truly unique and distinct personality. It always occurs in Charleston, SC, and is planned by the same (at least some of the same) inventive folks. This is the only conference that I’ve been to that has skits between the consecutive keynote sessions in the mornings. While it’s a little weird at first, it’s kind of refreshing. I love the themes of the Charleston Conference as well—”Anything Goes!” for 2010, “What Tangled Webs We Weave” for 2007, for example. This conference is smaller than SLA Annual and is always in the same venue (the Francis Marion and the Embassy Suites across the courtyard), so if you’re a repeat attendee, it’s easy to plan for lodging and dining (of which there are some amazing options in Charleston). This conference is also one of the rare instances where library product vendors/publishers truly participate in the conversation. Rather than just exhibiting their wares, you can find vendors/publishers presenting on the same topics as librarians, having the same debates and struggling with the same issues—just from their perspective. I’ve found this to be really enlightening and helpful in my career as a librarian. So, by all means, put the Charleston Conference at the front of your wishlist of conferences to attend. Speaking of wishlists—there are many other conferences within libraryland that I’d like to attend (and haven’t yet had the opportunity to attend). The Library Assessment Conference is one that I’m really looking forward to attending one day. My job is pushing me to learn new ways to assess the use, access, and composition of our collections and my sense is that this conference could help offer some helpful strategies. I’d also love to attend Computers in Libraries one day. I’ve heard so many great things about this conference. There’s an interesting-looking intimate conference taking place in June (abutting the SLA Annual Conference this year) that I’d love to be able to attend: the Science Bootcamp 2010 in Lowell, MA. This year, the topic is on E-Science and preparing librarians to help researchers who work in an E-Science landscape. Outside of libraryland, I’d like to one day attend an Emerging Technologies conference (EmTech) sponsored by MIT as one of those conferences that cut across disciplines to showcase what’s coming in terms of tech trends. I really love ALA Annual. It’s the one time I feel like I get to be a no-modifier librarian. Not a public librarian or a library director or a library techie or whatever: for those few days, I feel like a capital L, Librarian. Or maybe it’s more accurate to say that I feel like a multi-modifier librarian—whatever I want to learn about is available. I’m crazy about Association for Library Collections and Technical Services (ALCTS) programming. No matter the room size, their presentations are always efficiently run, with well prepared and informative speakers. Annual is the one time I get to see ALCTS presenters doing their thing. I always try to drop in on small or smallish committees and discussion groups. I just pick out an interesting-sounding group or discussion topic and play fly-on-the-wall while they talk shop. Watching ALA Council deliberate is fascinating. Though, of course, the best thing about Annual is seeing people I only get to see once or twice a year and meeting people for the first time, especially people whose work has influenced my thinking about how I do my job. My other favorite conference is code4lib, which is sort of the anti-ALA Annual. It’s single-track, which means everyone is in the same room most of the time. It’s small, it’s cheap, it’s specialized, and the presentations are short—just twenty minutes for the more formal-ish presentations, with plenty of time for five-minute lightning talks as well. During presentations, everyone in the room has a laptop in front of them and chats about what the speaker is saying, so just about everyone is participating most of the time, even if there’s disarmingly little eye contact. For me, the most notable thing about code4lib is that it’s amazingly democratic: code4libbers vote on everything. Prior to the conference they vote on the keynote speaker, presenters and presentations, and where the conference will be. During the conference, they vote on things like which groups should get the larger rooms during break-out sessions. It’s really wonderful to see people treat each other that way. And, despite the fact that many of them are friends who only see each other once or twice a year, they work very, very hard not to be cliquish. Of course, as with other library conferences, the participants are amazing librarians (even if many of them don’t have library degrees and a good portion don’t work in libraries) and the presentations are interesting and useful. More than any other conference I’ve attended, code4lib made me want to learn well enough to keep up with everyone else—to have something useful to contribute to every project that anyone discussed, because all of them were fascinating. It probably won’t ever happen, but the prospect of knowing enough to present at code4lib is a constant source of inspiration. Though I no longer belong to SLA or go to the conference—while there are many public librarians who belong to SLA, I think ALA and PLA provide more to me in my current role—I believe strongly that SLA Annual is the one conference every library school student should attend. To quote Hilary, “SLA saw me as a positive asset to their organization and began grooming me immediately.” No matter what area of librarianship you think you want to go into, no matter where in the world you think you’ll work, SLA has something to offer. That is, it’s big enough to be comprehensive but small and efficient enough to feel as though people know who you are and what you’re capable of contributing. In addition, I think it’s smart of SLA to bundle membership in the national association with membership in your local chapter. The Oregon Public Health Association Annual Conference is a good conference in one of my library liaison subject areas. The first time I attended (during election season two years ago) the conference had a very deep political bent and wasn’t crouched with speak of “neutrality” (as we often do in our professional library communities). During lunch speakers told us how to vote on local ballot measures. I didn’t agree with all of the choices, but I was glad to hear what the organization officially thought. In fact, it made me even more want to attend the conference in the future. In the future I’d really like to attend a HASTAC (Humanities, Arts, Science and Technology Advanced Collaboratory) conference. This group does some innovative deep (and critical) thinking about technology and learning; and HASTAC attracts professionals, academics and students from all disciplines. The problem is always finding and making the time to engage. On the whole, I’m hoping to find more regional conferences that are more participatory and enable me to take action with my new ideas when I get back to work. I must really love Computers in Libraries (CIL) as I’ve been there every year since I became a librarian except the first. Though, honestly, I mostly end up going because I present there (the most recent three times I’ve been there) and so they pay the registration. Plus, it’s in DC, so its drivable for me (I’m not much of a traveler). CIL is hit or miss for me from a learning view point. It’s often too simplistic for my techie tastes. But, because it’s fairly small and has a lot of repeat attendees, it’s great for socializing and networking. I always go to it excited to see friends again, and I always come back from it with new friends. The more I go to conferences, the more they are a social event rather than an educational experience. Most conference presentations are not the most efficient (or enjoyable) way to access the information being offered (exception, of course, for excellent and skilled speakers or for sessions that take advantage of the room of participants), so the real draw is just hanging out with other people in the field. And those connections lead places, be it personally or professionally. That was my general impression of the one ALA Annual I attended. The socializing was rewarding, but the presentations and meetings themselves felt much less worthwhile. Pres4Lib, an unconference about presenting that was held at Princeton Public Library in NJ, was a really positive experience. The very small size (we could all fit in one room) and the focused theme helped increase the social interaction and the informational content, as did the participatory pre-conference scheduling (attendees suggested topics ahead of time on a wiki). I’d like to go to more events like it, where everyone is encouraged to participate and everyone is there because the specific theme is of interest to them. Too many conferences are so broadly planned as to offer only sporadic interest, though, on the other hand, the serendipitous discover is less likely in a focused theme. Library Camp East was also an unconference, but it had no theme and thus, I thought, floundered a bit more in deciding what would be the focus of discussion. I have the feeling I’ll need to find more local conferences to attend, as the travel costs of doing elsewhere are hard to take. Though, now that I’m not officially a librarian (or working in a library), maybe I won’t be attending conferences at all. Time will tell. I’d really like to get to code4lib, especially now that I’m actually working as a programmer. I have to admit that I’m feeling a little intimidated by those lists above! Although I’ve been attending ALA Midwinter and Annual regularly since about 2005, that’s pretty much all I’ve attended on the national level during my career thus far. I haven’t even — gasp! 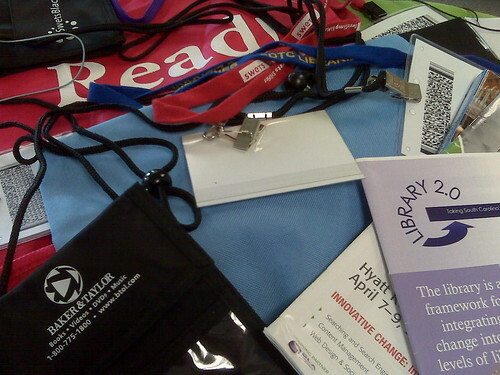 — been to an ACRL conference. It’s not due to a lack of desire, that’s for sure. It comes down to geography: unlike my fellow Lead Pipers I’ve been living in rather remote areas of the country where traveling is just more time-consuming and more expensive. Try booking a flight to Boise, Idaho, and you’ll see what I mean. In the end I just can’t make a good argument for spending either my library’s or my own money on more than the two ALA conferences in a year, especially in these times. I did have the opportunity to participate in last year’s ACRL virtual conference, which was better than nothing. If that is anything like other virtual conferences, though, I think they have a long way to go before they can compare to the real thing. I’ve attended the state library associations’ conferences in the places I’ve lived as a library student and librarian: two conferences convened by the Arizona Library Association in the mid-2000’s, and two Idaho Library Association conferences annually since 2007 (Idaho is a big state so each year they hold a state-wide conference and a variety of smaller conferences for regions in the state). I like being part of my state association; it makes me feel more connected locally. I particularly enjoy networking with others in my area and I appreciate the fact that every type of librarian and library staffer is gathered in the same room to share their unique areas of knowledge with each other. I learn a lot about what school and public and special librarians do at the state conferences, which keeps me tuned in to the larger issues that affect us all. I also appreciate the opportunity to give presentations, an opportunity that can be difficult to come by on the national level. I’m not going to list my “conferences I’ve attended” and those I’m considering, since the first list would be woefully short and the second would be woefully long. I accept the fact that living in the wide open spaces of the interior West means I have fewer opportunities to attend conferences, and as a result I seek out other ways to participate in the field. My committee work fills the void, as does the opportunity to connect virtually through this blog, through Facebook, and through a variety of webinars. Please join the conversation by sharing your conference experiences (or coping mechanisms) below in the comments. This is such a great post! I noticed no one mentioned any of the EDUCAUSE conferences. I attended EDUCAUSE ELI for the first time this year and walked away from the experience with more new ideas and feeling more inspired than I usually feel leaving a conference. As an instruction librarian, I felt like the mix of instructional technologists, faculty, administrators, IT staff, and librarians generated a lot of interesting conversations that helped me better understand the landscape of higher education. In particular, it was inspiring to join a community that was so focused on student learning and the role that they could play in improving the student experience. Just thought I’d throw that one out there as a possibility. Ah, I attended one day of a local EduCause conference (midatlantic) a couple years back. I have no memory of it, so I don’t think it was particularly exciting. My experiences at the Oklahoma Conference is similar to how Hilary describes Charleston in that it is in the same location every year, has great topics and speakers, and publishers/vendor participating in a real way. I have not yet been to Charleston and would like to. Like Kim, my travel has mostly been to ALA. I have also attended NASIG (North American Serials Interest Group Conference). As I understand it NASIG was formed in response to ALA’s lack of venue for specific serials issues. As lines between serials and electronic resoureces and acquistions and collection development have become so intertwined you are seeing more relevant sessions at ALA. But NASIG does provide a focused and lively forum specifically for the serials environment. The other gem about NASIG is its conference locations (Palm Springs this year and rumors of a Canadian venue soon). While the expense has prohibited me from going this year, there are scholarship opportunities for a variety of new and seasoned librarians. I want to echo the positive things Angie and Hilary have said about NASIG. It’s a small conference with a strong sense of community, bringing together vendors and librarians to discuss practical challenges as well as the “vision” of what is coming up over the horizon. The scholarship and first-timer mentoring programs can help library school students or new professionals get a panoramic sense of the complexities of print or online serials/e-resources management. If you’re thinking about attending in the future, looking over back issues of conference proceedings (published stand-alone and in the Serials Librarian) can help you get a feel for what it is like. Consider attending ISTE 2010. The ISTE Media Specialists SIG (SIGMS) has a slate of activities planned for librarians including a breakfast session with David Warlick on “Cracking the Native”, a forum “smackdown” led by Joyce Valenza and Gwyneth Jones, a 21st Century Media Center Playground, a birds-of-a-feather session, and a SIG Fair display. We will also have a lot of back-channel ways to participate. Watch for upcoming information and consider joining our ning group at http://www.iste-community.org/group/sigms whether you are a current ISTE member or not. All ALA conferences held in New Orleans, all the old Ohio Library Association conferences and all the AECT conferences (cheaper than Educause; often held simultaneously with Educause and I could always get a very inexpensive exhibit floor pass for Educause). These conferences were all beneficial for the same reason: I could get roaring drunk and so could everyone else. I neglected to mention another conference that I would LOVE to attend: Science Online, right here in Research Triangle Park, NC. My colleague, Josh Wilson, attended and was impressed by the experience. I’m definitely adding this one to my wishlist. – What it means to be a “capital L” librarian. This was such an intriguing comment and I’d love to hear more. – Analysis of 1 or 2 of the key ideas coming out of the conferences. Were any of the ideas on the future of libraries particularly insightful or feasible? Did any seem likely to engage the public in a dialogue about libraries? Maybe that’s a subject for another group roundtable. Derik – I’ve wondered the same thing. For librarians who make the leap to work for product vendors (for profit or non-profit), I’m curious about how this impacts their perception of themselves as librarians. Is this really just a gray area or is there a distinction that has an impact on future career choices? Great idea for a group post or article by/about one of those folks who has made that leap (maybe you, Derik?). Hmm. I’ll give it some thought and see if I have anything substantial to say about that. I just got back from LOEX and I’d have to say that if I could only attend one conference this would be it (with Internet Librarian being a close second). It is small, focused, friendly, short (day and a half), and relatively economical (meals are included in the registration fee). This is my third time and I always learn a lot and come back to work energized and inspired to reinvent my instruction. LOEX of the West is run by a different group on the same model and is equally good. I’m about to graduate ( in less than two weeks! ) and have recently attended a few symposiums that I thought were quite good. In Philadelphia, as a student, you can volunteer and that can help off set some costs of conference fees. In particular I always learned something new at NFAIS. I also recently attended a Healthcare Informatics Symposium sponsored by CHOP in Philadelphia. Here in Boston I’ve started to get involved with MAHSLIN. As for future conferences I’d love to check out InfoCamp, Computers in Libraries, Science Bootcamp and a few others! And last but not least attending SLA last year helped me get my new position here! So you never know!